Does your organization have an effective BYOD policy? BYOD stands for Bring-Your-Own-Device, and it's a staple of the modern work environment. Nearly every employee of every business has a personal smartphone or a tablet computer and the vast majority use those devices for work purposes. Since banning these devices is effectively impossible and not at all likely to result in improved productivity, forward-thinking businesses have begun to create formal BYOD policies that specify how employees may use mobile devices and how sensitive data must be treated on those devices. Although 39 percent of businesses have adopted a formal BYOD policy, fewer have incorporated robust infrastructural changes to their document-processing workflows that enable employees to work more efficiently with their mobile devices. This is the promise that Xerox Mobile Link delivers. The best way to enforce a value-added BYOD policy is by making mobile devices a valuable element of the document workflow. Xerox ConnectKey-enabled multifunction devices do this by allowing users to print, scan, email, and fax documents from their phones or tablet computers through the Mobile Link app. Essentially, the multifunction device becomes the interface between each employee's mobile device and the rest of the company. Users can scan documents to business email addresses, merge multiple documents, create PDFs, and send data to cloud storage directly from their smartphones. Receive scanned data from the office while attending a meeting out-of-town. Scan images of documents, combine them into a single PDF and upload the PDF to a collaborative cloud storage service, ready to be processed by the rest of the team. Send multiple copies of a single document to different destinations, including email, Dropbox, and other mobile phones – all with one-touch functionality. Print images and documents using the Xerox Mobile Print Service plug-in app for Android or iOS. This technology potentially turns each employee's smartphone into a remote control for their department's Xerox multifunction device. Using Xerox Mobile Link, document workflows that used to require employees leave their desks and walk to the printer can now be quickly and securely finished at their desk or outside the office. ConnectKey system's administrative control panel also allows supervisors review images and data traveling through the Xerox printer. Each user's activity is logged, creating an audit trail that can make investigating printer misuse much easier. For most businesses, the primary BYOD policy concern is security. Executives and supervisors are deeply concerned with employees keeping sensitive business data on their personal equipment – and rightly so. If an employee loses a personal device or accidentally exposes trade secrets using one, it puts the company at risk. The same risks exist for printers and multifunction devices. Although printers are less susceptible to physical attack since they never leave the office, modern network devices are as susceptible to hacking and data exfiltration as any other networked device. Xerox ConnectKey uses some of the tech industry's most advanced Cisco Identify Services Engine integration makes it easy to implement company-wide security policies. That same level of security goes into the connection between the Xerox multifunction device and each employee's smartphone or tablet. Benchmark mobile security along with protected device-to-device communication ensures that company data is safe when employees use Xerox Mobile Link to send and receive sensitive documents. One of the most useful features of Xerox Mobile Link is its compatibility with cloud storage services. The app supports One Touch Workflows – powerful user-defined sets of document capture and routing instructions – to let you send documents to specific cloud storage addresses with a single touch. 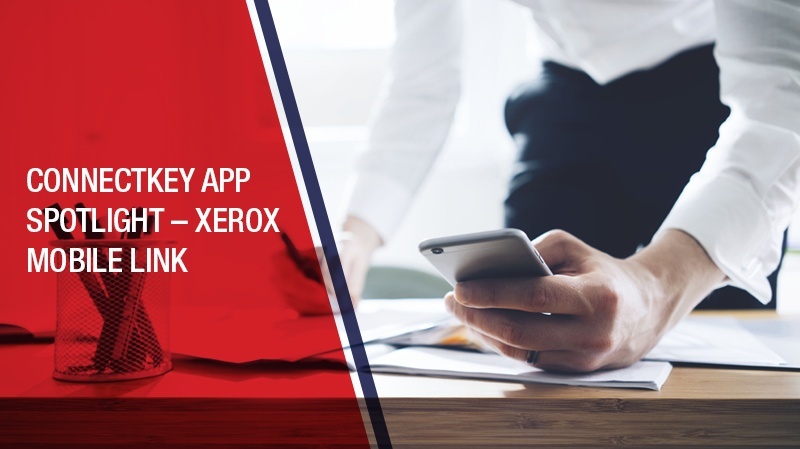 Xerox ConnectKey supports a broad range of cloud services, and with Xerox Mobile Link, you can set up One Touch Workflows to DropBox, OneDrive, and Office365. For all of these cloud storage services, you can choose between file format options, data plan usage, and more. The ability to take your entire office with you anywhere you go is a powerful resource for remote employees and traveling executives alike. Now, you can enjoy the full benefits of your Xerox multifunction device from anywhere in the world you can get an Internet connection. Processes that once took months by mail can be completed in mere minutes. Are you ready to incorporate Xerox Mobile Link into your document workflow? Contact us and ask us about our ConnectKey-enabled multi function devices!